Forever Manchester’s inaugural 5-a-side football tournament kicked off on Friday 28th February at the recently opened Soccer in the City. It saw teams representing three local Marriott Hotels, PricewaterhouseCoopers, Luxson, Brand Addition, Brown Shipley, We Are Adam and Forever Manchester battling it out for the prized trophy. 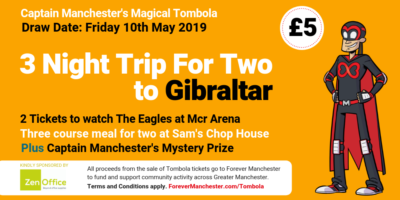 Forever Manchester’s team was made up of our Marketing Director Paul Haworth, FM ambassadors Michael Henderson of Riskbox and James McDonald, Ric Brooks and Sam Jones of Tunafish Media, and ITSourced’s Simone Spina. Forever Manchester went a man down in the second match so our ambassador Moyen Ahmed, who organised the tournament, stepped in. Luxson looked like a strong side early on with consecutive 7-0 and 6-0 wins but were beaten in the semis by the young PWC lads. Brown Shipley faced Marriott in the semis and sailed through to the final. The final was a tough one to call but Brown Shipley took the glory with a 7-5 win. The Player of the Tournament was Alex of Brown Shipley and his teammate Sean took the Top Goal Scorer trophy home. All the players gave it their all enduring sweat, blood and tears (well maybe not the tears) and the tournament raised £1,400 to help local people and communities. Huge thanks to Moyen for organising a fantastic day and to everyone who took part. Thought about doing your own football tournament? Why not organise one at Soccer in the City to raise money for Forever Manchester? Visit www.soccerinthecity.com to find out more. Pictured from left: Simone Spina, Michael Henderson, James McDonald, Paul Haworth, Sam Jones and Ric Brooks.